To make trifles, cut brownies into 1/2-inch squares. 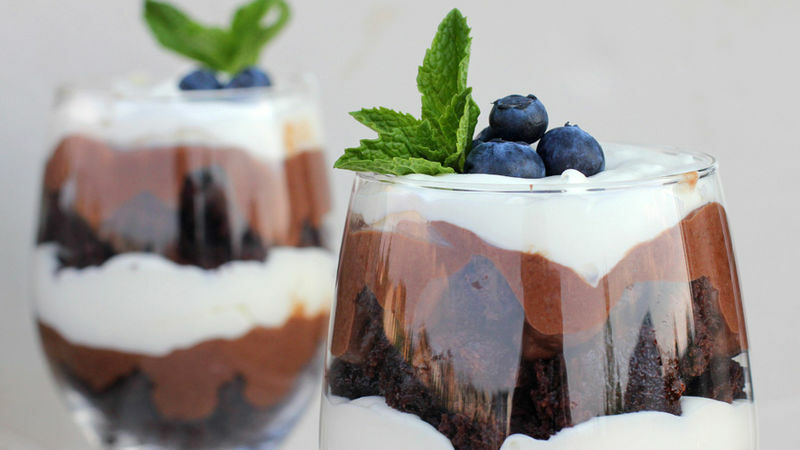 Place layer of brownie squares in bottom of trifle bowl or 4 to 6 deep wine glasses. Spread layer of pudding over brownies. In medium bowl, stir together frosting and thawed whipped topping until smooth. Spread layer of frosting mixture over pudding mixture. Repeat with second layer of brownies, pudding and frosting mixture. If desired, garnish with fresh berries and mint sprigs. Store in refrigerator. Simplify the process by using prepared pudding, rather than a box of instant pudding. Easy as can be! Switch it up! Try this recipe with Betty Crocker™ Super Moist™ natural vanilla cake mix and vanilla pudding mix, or chocolate cake mix and white chocolate pudding.